Random drop at every location where you can cut wood. Acorns are used to plant a Guild Forest. Acorns can also be randomly found as planting your guild forest. 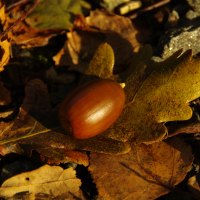 Acorns were also a random drop on the Golden Harvest Festival 2009.